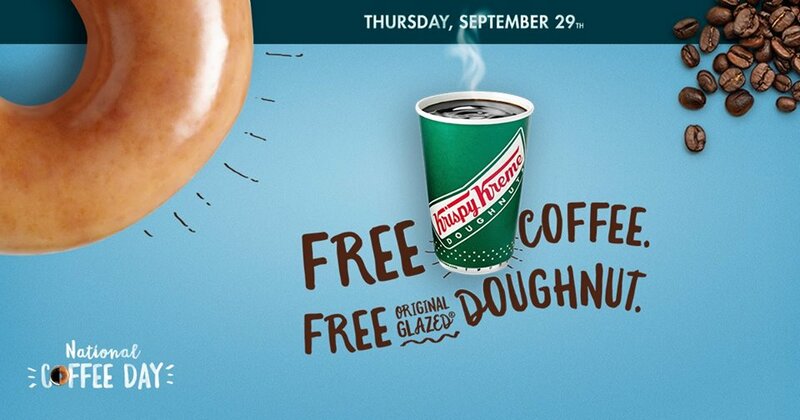 Savvy Spending: Free Coffee and Doughnut at Krispy Kreme on 9/29! Free Coffee and Doughnut at Krispy Kreme on 9/29! You can pick up a FREE Coffee and Doughnut at Krispy Kreme on National Coffee Day! September 29 only, visit any participating Krispy Kreme Doughnuts to free small coffee and a free Original Glazed doughnut. The offer will be valid at participating shops from the beginning of regular business hours until close of business on September 29 only.